Ever see a polish so odd you had to buy it? That's what happened here. I'll say right off the bat that I don't exactly like Revlon Wild...but I also don't hate it and I'm somewhat confused by it. Wild has a frosty finish, shifting from pinkish-gray to minty green, with tiny flecks that shift from green to pink. 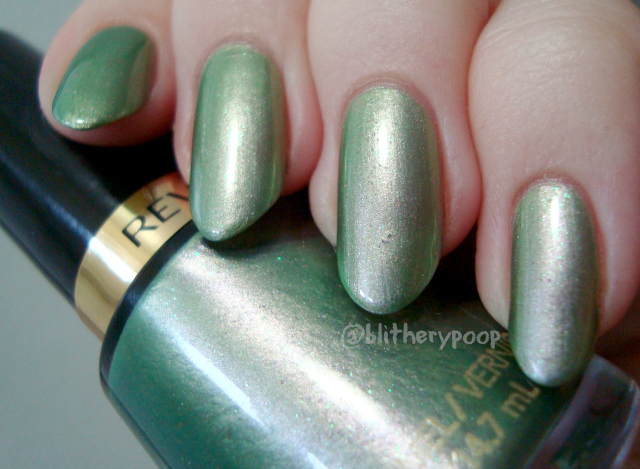 Gotta wonder what Revlon was thinking with this one. Frosts have been making a bit of a comeback, but to add one this...distinctive...as core their classic line seems like a strange choice. I mentioned before that I can't quite decide how to feel about Wild. It's kinda...fugly, but in a way that I sorta enjoy on some level. I wore a lot of 70's polyester shirts when I was in my teens and I think it's got the same retro tacky appeal. The Wikipedia image for the Chevette is an amusingly similar color. The formula has its drawbacks. This is three coats and I had to fight brushstrokes the whole way. I got bubbling, since Revlon's classic line doesn't like my body chemistry, but it was pretty tiny. There were also two small clumps of unknown origin, which you can see on my ring and index nails. I'll probably give Wild another shot over OPI Damone Roberts 1968 or something like it the next time I feel retro. It's kinda appropriate that I was watching Fear And Loathing In Las Vegas for the millionth time while swatching Wild. It would have looked perfect on any of the women in the bar scene. You know, before they turned into reptiles. The shimmer flecks really don't show up all that well in my photos, but in person they show up on the nail only slightly less than in the bottle. The green is most visible at the grayer end of the base's shift and they turn pink as it turns green. So quirky! Bottom line: Endearingly odd if you can get past the formula's completely predictable hassles. I really wanna know what you guys think of it! 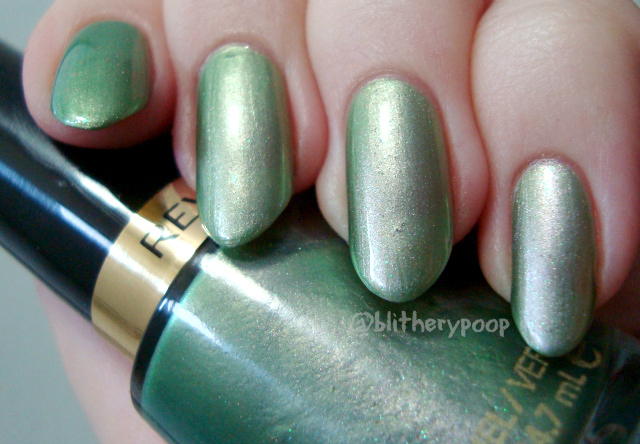 While I've got you here, I know some bloggers are boycotting Revlon due to a recent news item. I'm aware of it and I do understand the offense taken, but I'm keeping in mind that these claims were made by a disgruntled former employee. Maybe he's telling the truth and has reasons to be angry, or maybe he was fired for valid reasons and is lashing out. That's for the court to decide. I'm reserving judgement until the results and facts are clearer. Hmmm, I don't think I like it. It definitely has a retro 70s vibe, but in all the worst ways. LOL! I looked and looked at this polish and finally decided I had a better use for 5.00. It looked like a frosty mess in the bottle, but I was still sort of curious because of the possible duochromeishness. It's definitely not for me, but thanks for trying it out....for science and all ! I bought it because it was unusual, but haven't tried it yet. I also am not sure if I like it or not! Thank you for sharing, I almost bought this yesterday but decided to pass. I don't think I will be going back for it. I dunno, I'm kind of feeling it. I have a weird soft spot for retro greens, though. What's making me less interested is the formula issues. Ain't nobody got time fo dat. 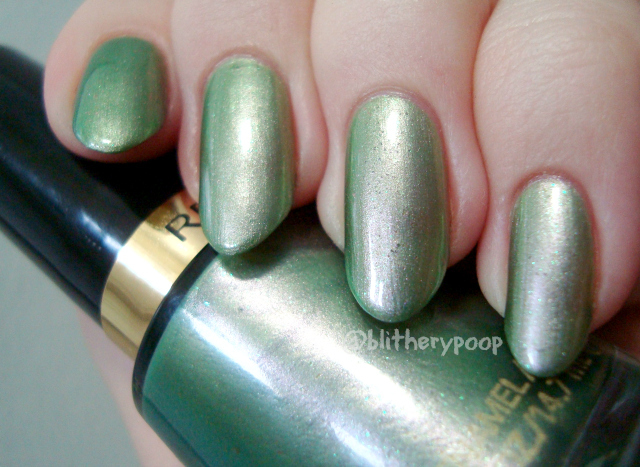 It kind of looks like a green version of Butter London Knackered, which I either gave away or sold, so I should probably skip this one. And yet I'm still tempted . . .